Effective corporate reporting and disclosure are critical in financial markets to promote vigorous competition, optimal performance, and transparency. This book examines whether existing disclosure frameworks in eight countries with the world’s most significant securities exchanges achieve these objectives, and then, drawing on extensive empirical findings, identifies the policies and practices that contribute most to improving the overall quality of listed company reporting and communication. A significant portion of the book provides an overview of disclosure regulation and practice in the United States, Canada, Germany, the United Kingdom, Japan, Hong Kong, Australia, and Singapore. A highly informative survey looks at company reports, disclosures, and websites of large listed companies, including Microsoft, Citigroup, Teck Resources, Deutsche Bank, BP, Sony, PetroChina Company, BHP Billiton, and Singapore Telecommunications. 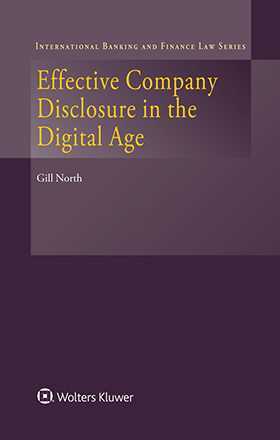 The book discusses common disclosure issues that arise across jurisdictions, provides valuable insights on the efficacy of existing disclosure regulation and practice, and highlights the important principles, processes, and practices that underpin best practice company disclosure frameworks. It will be welcomed by company boards and executives and their counsel, as well as by policymakers and scholars in the areas of corporate, securities, banking and financial law, accounting, economics and finance. PART II Company Disclosure Regulation: Theoretical and Conceptual Bases. CHAPTER 2 Mandatory Corporate Disclosure. PART III Company Disclosure Regulation: Country Profiles. CHAPTER 8 The United Kingdom. PART IV Company Disclosure Regulation and Practice. CHAPTER 13 Periodic Disclosure Regulation and Practice. CHAPTER 14 Continuous Disclosure Regulation and Practice. PART V Company Disclosure: Best Practice & Conclusion. CHAPTER 15 Best Practice Company Disclosure Frameworks.